Terrorists take over a 747 bound from Athens to Washington D.C., supposedly to effect the release of their leader. Intelligence expert David Grant suspects another reason and convinces the military that the ‘plane should not be allowed to enter U.S. airspace. 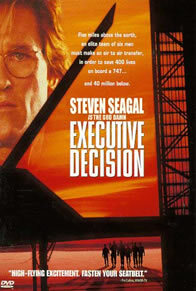 An assault mission is devised, led by Steven Seagal as Colonel Austin Travis who board the jet by travisusing in a specially equipped ‘plane designed for mid-air crew transfers, and Grant finds himself aboard the 747 with a team of military anti-terrorists who have to defuse a bomb and overpower the terrorists. William James Jones Catman .